At the end of the 40s, when economic conditions were still difficult in Europe after the Second World War, the Company ALCA (Anonima Lombarda Cabotaggio Aereo), located in Milan, Italy, manufactured, or at least tried to produce a small car in series tandem-cylinder two-stroke, called Volpe. 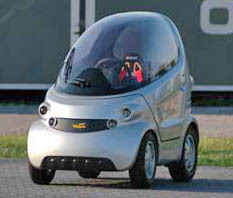 Body: type two-seater cabriolet with a folding hood, monocuerpo veneer filled and sealed with transverse reinforcements, the dvidida Structure is in three parts, the previous accommodation of the battery and a small trunk, the plant is located where the two passengers besides the dashboard and the spare wheel and later we find the petrol tank and engine. Front suspension: crossbows cross with shock, Rear: Average crossbows placed lengthwise with the shock. Engine: cylinder of 124 cc (42x45) and 5500 rpm air-cooled, lit by a magnetic plate of 50W, up by hand or foot, light alloy cylinder head change and four walks in front and one behind. Dimensions: 2.50 m long, 1.02 m wide, with high canopy closed 1.06 m, 1.50 m wheelbase, turning space of 2.75 m and weighing 135 kg (300 kg up). Performance: 75 Km / hr maximum speed, maximum gradient 25% surmountable, stopping distance at 60 km / hour: less than 7 meters. The immediate post-war Italian was filled, at least in terms of transport, from a genuine, naive and - at times unjustified - optimism against all that could be or at least appear to be an innovation in comfort and more to move. With the enthusiasm of a nation that emerged from a disastrous war, the Italian industry was trying to raise his head, supported initially by the cheaper two-wheel: the Garelli Mosquito motorized bicycles, while Piaggio filed in 1946 the legendary Vespa. The vehicle mass, yet to be created, our industry suggested means simple, inexpensive, sturdy and useful, copying some 'what already had been conceived before the war (in Italy but also in America, England and Germany) and a propose original projects. In addition to Fiat Topolino and several motorcycles super-economy, our industry did not offer much to the mass of Italians eager to move in freedom and autonomy, short of returning to a normal life and better without spending figures impossible for the purchase and maintenance methods. In this climate comes the curious ALCA Volpe, a microvettura designed precisely to the wishes of millions of Italians, for the first time to grips with the purchase of a car. Presented in 1947 by the fledgling company Anonima Lombarda Cabotage Air (ALCA), the Volpe has actually very little like a car conceive today. During a spectacular presentation in a Roman theater on March 30 1947, and attended the then famous comedian company Erminio Macario, the Volpe is advertised as the ideal choice for the mobility of postwar Italian. The vehicle discovered two posts has moved from an engine cylinder two-stroke 124cc (seems developed by Ing. Gioachino Colombo, famous for the first Ferrari engines) and 6 horses at 5,000 rpm, and later placed in a position to push theory the Volpe to 75km/h maximum speed. 250 cm long and 102 wide, the tip Volpe everything about lightness and simplicity constructive, with a total weight of 135 pounds, surrender of the rear differential (due to reduced carriageway of the rear), goodwill "tear" as the outboard and the power-fluctuating exchange through a single anchor to the body, like the Vespa Piaggio. The height of Volpe is a closed hood of 106 cm, the short step is only 150 cm and the diameter steering is 2.75 meters. The body bearing steel plates had rounded lines and sought, but the size reduced, joined the large windscreen in synthetic resin, made every person on board more like a child on a pedal cars that an adult "in car ". The small two-stroke was obviously fed a mixture and air-cooled, the change was a 4-speed transmission (+ back) without friction, with leverage at the wheel and preselettore, the suspensions were a crossbow, with the front transverse and longitudinal two half-leaf behind, aided by telescopic shock absorbers. The braking system was entrusted to the good old drum with mechanical control (no complicated and expensive hydraulic), two front and rear with a single. Other aspects curious and in some ways laughable project Volpe were also tiny wheels 4.00 J x 8 inches and fragile hood that opens with arches joint. Other figures speak for a maximum slope exceeded 25% and a standstill to 60 km / h in less than 7 meters. These unusual features would probably had a good product at low cost, if that had not existed only on paper: the FTAA is, after the Roman glitzy presentation and a discreet battage advertising, failed to build more than a few copies of the preserie Volpe Many of them probably without an engine running. After only 6 specimens produced the Fox vanished, as the manufacturer ALCA, which in 1948 was suspected of fraudulent bankruptcy after having pocketed the advance of customers who had ordered the microvettura (about 300 million pounds in total). In the same business strategy launch is the inclusion of five ALCA Volpe to the first postwar Mille Miglia, that of'47, three of them arranged in a turbocharged version fantomatica without hood and have rounded aerodynamic tail with integrated headrests. The five cars do not ever presented on departure. 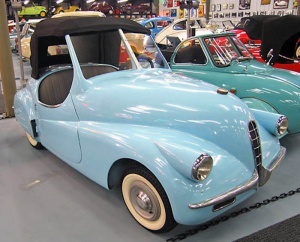 The big scam of "Volpe ever born" was also involved the Spanish Gemici Auto Internacional SL Madrid, who in'47 decided to build on the license Hispano Volpe, MICROCAR Italian version of the Iberian market, Portugal, Morocco, Latin America and Spanish colonies. As you can imagine, nobody has ever establishment Madrid sfornato no Hispano Volpe. The few surviving copies of ALCA Fox are now in museums or private collections, silent witness of a dream that has deluded and disappointed many Italians, one of the first pies in Italy after the war. The thing that turns bitter in the mouth is that Fox has in some ways prefigured early and some of the super-economic solutions that are then taken on MICROCAR of some success marketed almost ten years later: the first in the Kleinschnittger F125, then the Iso Isetta, the Messerchmitt Kabinenroller (Mival in Italy), Brutsche Mopetta and Glas Goggomobil.